I think I am going through a phase. There hasn’t been meat in my refrigerator (except for the stray piece of prosciutto) in weeks. When I went out to dinner last week, both my appetizer and my entree were devoid of meat. As I sit here and think lustily about the steak tartare at Vine, I make carpaccio of another kind. I do believe I have stumbled into a vegetarian stage. When left to my own devices, I tend to cook dishes for myself that are meat-free (save for seafood). My cabinets are stocked with chickpeas & lentils. My fridge tends to be full of produce only. My own cooking tastes and instincts don’t really require that there be meat in every dish. Quite the contrary. Eating it has become the exception and not the rule. I am stressing here that this may be a phase – I can’t imagine life without bacon. 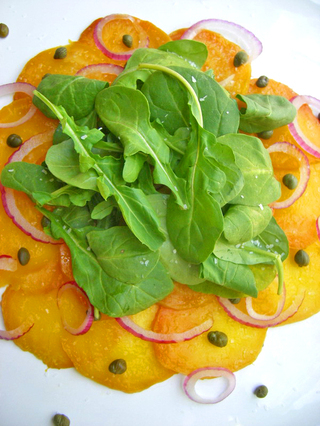 So I was sitting…thumbing through my archive of cooking magazines and came across this lovely recipe for Golden Beet Carpaccio. While I have been tinkering with the idea of going out for a plate of tartare and a glass of wine, I made this dish instead. It takes the traditional preparation of carpaccio and makes it a vegetarian dream. The golden beets are a good earthy, sweet foil to the onion and the salt of the capers. Instead of just dressing my version with olive oil, I made a quick vinaigrette and drizzled it over the dish once I plated it. A little acid brightens up all of the flavors and ties them together. – Preheat oven to 375. Toss beets with oil in roasting pan. Sprinkle with salt. Cover pan with foil. Roast beets until tender, about 50 minutes. Let beets stand at room temperature still covered for 20 minutes. Peel beets. Place in bowl. Cover and chill for at least one hour. – Toss onion, oil, capers, and chives in small bowl. Season to taste with salt and pepper. Thinly slice beets. Arrange in concentric circles on each of 6 plates. Mound arugula atop the center of the beets. Spoon onion-caper mixture over. Season with additional salt and pepper. Looks delicious Tami. Is it taken with the new camera? Having jumped back and forth between these phases, I’ve come to believe that there may be some scientific reason for this phase, at least that’s my story :)! Simple and elegant, and as usual stunning photos! Looks very good, I am a huge fan of ‘standard’ carpaccio and this looks like a faithful vegetarian representation. Thanks again dear lady for bringing these tasty looking things into our lives. Good color contrast, I can’t see any of the dressing, did you dress it after the photo? The color in those beets is fantastic!